As you may have realized that the free Yahoo site explorer tool is gone for good. Now the search begins for free Yahoo site explorer alternatives to find backlinks for the domains. To be frank there are not many. Most of the online tools that you find are actually using another service under the covers. So that leaves us with very less affective free options. Lets look at some of those. 1. Blekko search engine: This is the best free yahoo site explorer alternative to find backlinks. The screen are quite easy and user friendly. 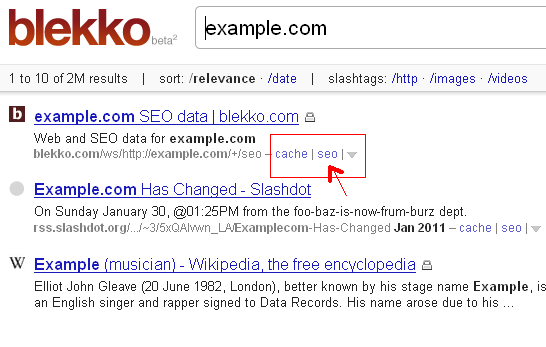 In order to use Blekko just type the domain name in the search box. Then click on the SEO link to get a very detailed and user friendly SEO report which includes backlinks. Only drawback here is the number of backlinks it reports are less than yahoo site explorer. But this might be the best free alternative out there today. This shall return all the sites linking the domain example.com. Drawback with this mechanism is that it returns less backlinks as compared to Yahoo site explorer. 3. Google webmaster tools: This is yet another free options to find backlinks. There is however one major drawback of this tool, that is it only shows backlinks to your domain. This tool cannot there be used for competitive analysis. 4. Opensiteexplorer.org: This is yet another free alternative. Tests with this option reveal that number of backlinks returned are quite inaccurate. There are more features in this tool but those needs subscription. 5. Exalead: This is another free yahoo site explorer alternative. This is not so well known search engine but gives insights into in links to any domain. Use following command to find out the backlinks. Based on the analysis above there does not seem to be an free yahoo site explorer alternative that gives us all the functionality. Hopefully Bing would think of providing some better tools and beat Google to it for a change. 6. Linkdiagnosis: This tool requires user to install Firefox plugin. Without the Firefox plugin this tool does not work. This tool will provide backlinks for any domain but they are limited in number. The tool interface is quite good and gives other information also such as filtering based on pagerank, follow or nofollow tags and page age.